Few fanciers can name the AKC presidents. They come and go, barely remembered. August Belmont is possibly the only exception. His 28 year reign of terror forged the innovations that made AKC what it is today. His successor belongs to the first category. Hollis Horatio Hunnewell took the reins in 1916 and presided until 1921. The biggest development during his presidency was the relocation of AKC headquarters from Liberty Street to Park Avenue South where it remained for the next 44 years. In reality, Belmont was a hard act to follow. Among other things, he bailed AKC out of the red when he stepped into office and supervised its incorporation. He managed the acquisition of various registry records that were melded into the AKC studbook, initiated the first reciprocal registration agreements with foreign kennel clubs, and founded the Gazette. But Hunnewell was familiar with that territory. Regardless of his success in life, he was destined to fall short of the expectations dictated by his family heritage. Hunnewells had set the bar impossibly high. His great grandfather, Dr. Walter Hunnewell, grew up during the Revolutionary War. His Harvard classmates included John Quincy Adams, William Cranch, Thaddeus Mason Harris, James Lloyd and Samuel Putnam. At age 15, his son, Horatio Hollis Hunnewell, left for Paris seeking his fortune. The Paris-based banking house, Welles and Company, provided him with a wildly successful career and Isabella Pratt Welles, daughter of one of the firm’s partners. Life was good until a national banking crisis prompted the abrupt failure of Welles and Company. H.H. returned to America with a wife, growing family, and he was broke. Within a year, he tapped into that classic American recipe of mining/steel/railroads that yielded countless nineteenth-century family fortunes. After rebuilding his fortune, H.H. turned his attention to his passions for family, botany, and design. The Welles homestead outside Boston became ground zero for all three. Originally purchased by John Welles in 1836, it was gifted to his daughter, Isabella Welles, after her marriage and subsequently christened Wellesley in her honor. In 1852 the Hunnewell family moved to their newly built palatial country house, the first of many architectural masterpieces that eventually dotted the estate spread over forty acres. 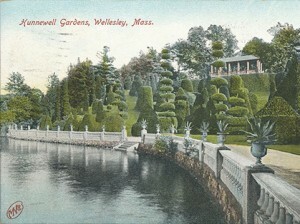 By the early 20th century, Wellesley featured twenty contiguous Hunnewell estates. In addition to creating fabulous homes for seven of his nine children, H.H. earned international renown for his private arboretum that showcased over 1,000 plant species and became the centerpiece of family life for six generations of Hunnewells. Both the town of Wellesley and Wellesley College signify his generous endowments to social and educational institutions – along with the towns of Hunnewell, Kansas and Hunnewell, Missouri. Hollis was 14 when his father died in 1884. His mother died a few months after he graduated from Harvard in 1890. At age 21, Hollis possessed an impressive chunk of his grandfather’s vast fortune. The unmistakable gloss bestowed by generations of money and good breeding defined his social niche. And Hollis could have easily cashed in on the free pass of his effortless charm, devastating good looks, and an impeccable family name. Instead, he was determined to carve out a personal identity. His athletic skills made him a nationally ranked tennis player. The ensuing celebrity status launched him into marriage with the Amazonian Newport heiress, Maud Somerville Jaffray. In addition to tennis, golf, and riding, this six foot tall athletic phenom earned accolades in very unladylike pursuits like baseball, fencing, boxing and wrestling. They married in 1891 and set up house at his father’s palatial residence where Hollis built America’s first squash court and his Fox Terrier kennel. He registered his Hill Hurst prefix in 1892, a reference to his father’s portion of the Wellesley estate. He was elected AFTC Secretary in 1898 and became its AKC delegate a year later. He held the position until his death. It also became the conduit to his lifetime commitment to AKC. He was appointed to his first official AKC position in 1899 and became a vice president in 1901. His illustrious grandfather died a year later at age 91. That was a pivotal year for Hollis. Quite possibly, these personal misfortunes intensified his growing commitment to the dog game. By then, Belmont must have begun perusing the ranks for a suitable successor and it’s understandable that his AFTC home turf would be a primary focus of this search. Hollis was tapped as AKC first vice president in 1909. It’s easy to understand why he was singled out. He grew up encoded with dedication to social responsibility and public service. At AKC he quickly distinguished himself for his diligence, consistency, and meticulous work. Even so, he was no Belmont; as AKC historian John Marvin noted, “Two decades of experience had prepared him for what must have been the somewhat daunting prospect of succeeding Mr. Belmont.” In 1916, Hollis became AKC’s fifth president. Marvin rather diplomatically describes his term in office as, “capable and orderly, representing a smooth transition to a new era.” In the real world, that would signify a substantial level of success. However, in Hollis’s family, the AKC presidency ranked as nice, but definitely not a major league accomplishment. He remained at the helm until 1921 when his deteriorating health forced his resignation. He died at his posh midtown home at age 53 on January 25, 1922. Posted by chesliepickett on Nov 4 2014. Filed under Current Articles, Dog Show History, Featured. You can follow any responses to this entry through the RSS 2.0. Both comments and pings are currently closed.